Agricultural Bank of China made a lacklustre stock market debut in Shanghai Thursday, with its shares rising only slightly, in what is still shaping up to be the world's largest initial public offering. The last of China's "Big Four" state banks to go public is on track to raise a record 22.1 billion dollars in a dual listing in Shanghai and Hong Kong that has put a spotlight on investor confidence in the world's number three economy. AgBank chairman Xiang Junbo called the IPO an "important step" towards the bank becoming a "global, first-class commercial" institution, before striking a gong for the start of trade with Shanghai Communist party chief Yu Zhensheng. "We are relatively satisfied with today's stock prices, which reflect investors' positive views on AgBank's current status and outlook," the bank's president Zhang Yun told reporters shortly after trading began. Tourists are seen outside a building housing the key Shanghai branch of the Agricultural Bank of China located on the historic Bund, in the coastal city. AgBank makes its Hong Kong debut on Friday. The opening days of trade could signal whether the bank will maximise the number of additional shares it can offer to make IPO history, beating Industrial and Commercial Bank of China's 21.9-billion-dollar offering in 2006. But after some analysts predicted a major jump in prices after the debut, shares ended the morning session at 2.70 yuan -- up just 0.80 percent from the IPO price of 2.68 yuan, but lower than the opening price of 2.74. "The performance is weaker than expected," Shen Jun, a strategist at BOC International (China) Ltd, told Dow Jones Newswires. Yan Li, a Beijing-based analyst with Southwest Securities, agreed AgBank was unlikely to soar. "We didn?t expect it to shine on the first day," Yan told AFP. "It will end the day roughly flat, the same as the opening level, because the lender and regulators cannot afford the embarrassment of it falling below the IPO price on the first day," she predicted. China is on track to be the world's biggest IPO market this year with up to 300 companies expected to raise 500 billion yuan (close to 74 billion dollars) this year, according to PricewaterhouseCoopers. The total number of AgBank's IPO shares is not yet known and will be determined by its market performance. A strong start will mean AgBank will fully exercise its over-allotment options by selling an additional portion of up to 15 percent of the number of shares initially issued for the IPO -- making it the world's largest. AgBank said Thursday the Hong Kong portion of its IPO was nearly six times oversubscribed, but did not indicate if it would fully exercise the over-allotment option. 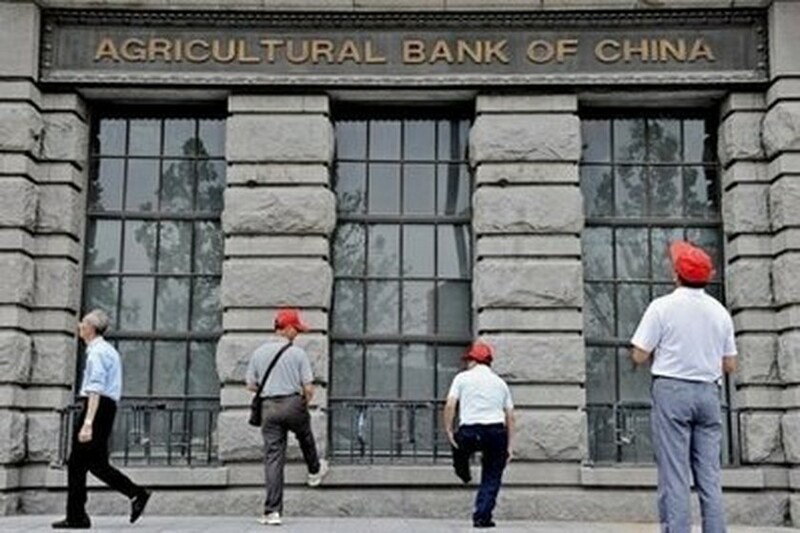 The bank was founded two years after Mao Zedong's 1949 communist revolution, with a mission to lend money to China's poor farmers and distribute state money in rural areas. But heavy exposure to China's poverty-stricken interior meant that mission was frustrated by decades of chaotic policies, leaving it awash with bad debt. Despite Beijing's efforts to salvage AgBank by wiping more than 345.8 billion yuan from its books, it remains the weakest of China's big banks and it remains to be seen whether it can shift from policy bank to profit-oriented company. Zhang told reporters on Thursday he expected AgBank's full-year profit for 2010 to rise 30 percent on year and hinted at the bank's future ambitions by saying it would build a strong international network. AgBank's stock market debut came after Fitch credit ratings agency warned of growing risks in China's banking system. The agency warned in a report that complex deals were obscuring hundreds of billions in loans and possibly concealing a new batch of bad property and infrastructure lending. AgBank's Hong Kong sale nevertheless drew almost a dozen heavyweight investors, including Qatar's sovereign investment fund, British bank Standard Chartered and Hong Kong's richest tycoon, Li Ka-shing. The biggest investor in the mainland issue was China Life, the nation's biggest life insurer by premium income. A total of 40 percent of the mainland shares went to 27 cornerstone investors -- mostly state-owned entities ranging from Cofco Ltd, China?s main grain producer, to China Aerospace Science and Industry Corp to the operators of the Three Gorges Dam.